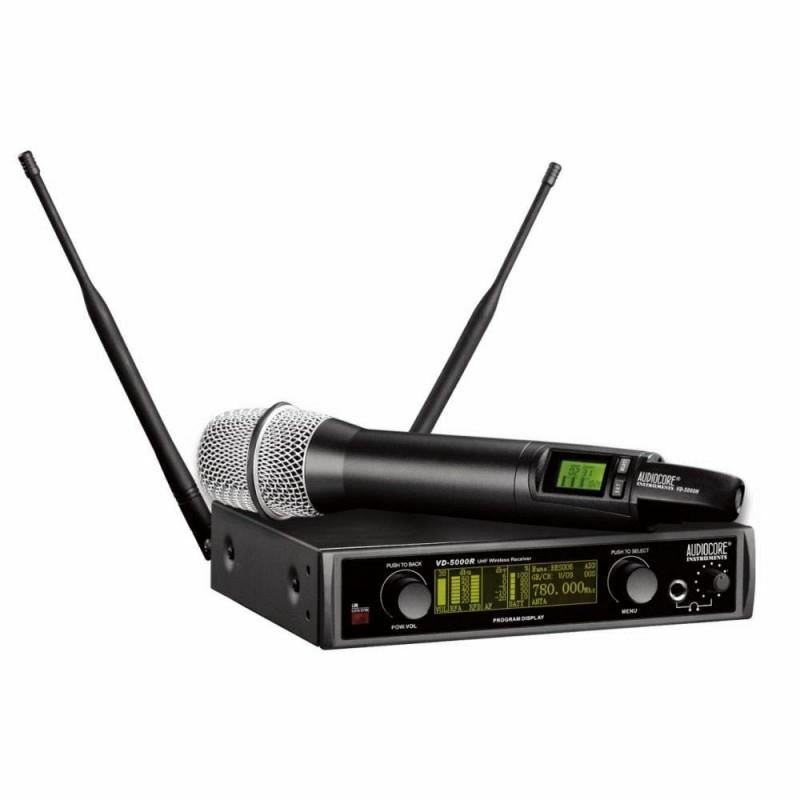 With its outstanding audio quality, the Audiocore VD-5000 Wireless System offers numerous potential applications for live performances and permanent installations. The working UHF frequency range is 734 MHz to 776 MHz. Both the handheld microphone and belt pack transmitter versions ensures any vocalist, speaker or instrumentalist optimal transmission of his or her performance whilst providing the greatest possible freedom of movement. By means of a threaded connection, the microphone head of the handheld transmitter can be swapped quickly and easily (dynamic and condenser capsules). The half-rack True Diversity receiver houses numerous system features: for example, a transmitter battery status indicator on the receiver display; an indicator for the (transmitter) "Mute On/Off" function on the receiver display; 4 EQ presets that are switchable at the receiver, and much more. A highly professional system embodying the outstanding value-for-money that is so typical for Audiocore Instruments. Audiocore WHL-3241U (2 Mikrofon Genggam & 2 Bodypack Clip-on Wireless UHF)Overview:Jangkauan frekuensi UHF yang luas: 500~900 MHz32 pilihan frekuensi untuk setiap channelKontrol mikro prosessor dan teknologi sintesis frekuensi PLLPenyaring suara dengan sistem anti-interferensi kualitas tinggiLay..
Shure GLXD24/SM58 Handheld Wireless SystemGLXD24/SM58 Handheld Wireless System from Shure includes a GLXD4 wireless receiver and a GLXD2 handheld transmitter with an SM58 microphone element. The system operates on the 2.4GHz ISM band in the Z2 frequency band between 2400 and 2483.5MHz. Both the..